Explore New Orleans' most colorful and decadent district with this 2-hour French Quarter walking tour. Learn about the neighborhood's history on a leisurely stroll filled with tantalizing sights and sounds. Hear ghost stories, vampire stories and even learn about the infamous voodoo that took place in New Orleans. This tour has it all. During the tour guests will be allowed to stop in a different bars along the tour route to get to go drinks. Some bars allow children inside however some do not. Begin your tour meeting your guide in the heart of the French Quarter, ready for beaucoup fun. The cultural hub known as the French Quarter has long been a popular tourist destination on account of its lavish atmosphere and 19th-century style. Get a unique perspective on the area’s history while you're introduced to both popular stops and hidden gems that only a local would know about. This tour will provide history, ghost, vampire and voodoo stories. A real EMF Meter - Ghost/Paranormal Detector will be used during this tour. This tour stops at many attractions and National Historic Landmarks that this city has offer. Visit St. Louis Cathedral, Cabildo, Presbytere, Ursuline Convent, and Jackson Square during the tour. 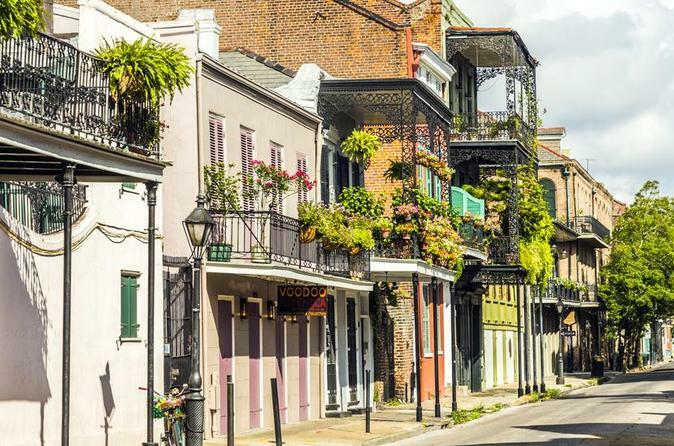 This walking tour gives you an intimate insider’s glimpse into one of the most famed neighborhoods in the country, the Vieux Carré. Get to know this city like you’ve lived there your whole life. Guests will be allowed to stop in bars along the tour route to grab a to go drink (adult beverages or soft drinks) and use the restrooms. Then the tour group will head out to the next location. Please keep in mind that some bars allow children inside however some do not.